Despite our best intentions, many people find murder fascinating. And yet because it’s the worst of crimes, to rob another person of their life, we hold killers in contempt. Even as we despise them, however, we struggle to understand them, to know what quirk of gene, character or fate compelled them to commit such a heinous act. Basic astrology tells us that, at the heart of every crime, evidence of the prime malefics must inevitably be found. Mars is the significator of fighters and warriors, of rage and violence. Saturn represents executioners, undertakers and death itself. The moon’s nodes, Rahu and Ketu, because of their association with eclipses, are associated with the notion of “snuffing out the lights.” And although the nodes can act as proxies for any planet with which they have a relationship, their default affinity is with the two visible graha most associated with killing. Thus, Rahu does duty for Saturn, as Ketu does for Mars. More ominously, perhaps, Rahu and Ketu reflect derangement, a disturbance of the natural order, a violent rent in the fabric of normal behavior. Nodal influence disturbs the emotions, mental stability, relationships, health, career and everything else it touches. Little wonder that we regard the shadow planets as prime suspects in cases of murder. As part of a larger study on nodal effects, I’ve been gathering birth data for perpetrators of homicides. To date, I have 195 timed charts for known killers. Although this falls short of what a statistician might want for a serious study, I remind myself that I’m an astrologer, not a statistician, and I’m just doing what I can. Until I’ve gathered more data, I ask the reader to regard the following as preliminary findings in my ongoing research. My original focus was the nodes, so let’s start with them. Because Rahu represents the head of the celestial cobra, it’s typically regarded as the more dangerous of the two nodes. The head of the cobra contains the eyes to see (or mesmerize) its quarry, the fangs to inject venom into its victim, and the hinged jaws via which it can swallow its paralyzed prey. Conventional wisdom says natural malefics do well in upachaya houses (3rd, 6th, 10th, and 11th). 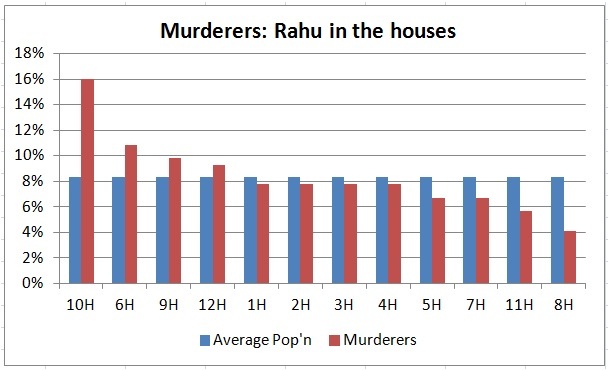 Whether we dare speak of “doing well” within the context of homicide is debatable, but the key observation here is that, regarding Rahu as an agent of evil, it seems to wreak its havoc most readily in houses 10 and 6. One characteristic of the king cobra, which can grow up to 18 feet in length, is that it’s capable of rearing up until its head is five feet off the ground, almost the height of a human. As such, it can strike primal fear into anyone nearby. Whether it intimidates by its mere presence, or subjugates by its fixed stare, is moot. This research includes several serial killers, Ted Bundy among them, whose Rahu in the 10th is an appropriate example of his ability to charm, seduce and compel his victims to a killing field. Cobras and other serpents are also masters of camouflage and stealth, lying in wait until their unwary prey walks within striking distance. Thus, the 6th house is symbolic of the victim’s blind spot (12th from the 7th) from which the cobra can strike without warning. Here we have killers like Albert DeSalvo, aka “the Boston Strangler,” whose Rahu in the 6th symbolizes operating under cover of darkness or disguise, or using the element of surprise to overpower and kill his victims. Using a greater-than-10% frequency cut-off for significance, I found Mars exceeding that value in houses 8, 9 and 7. 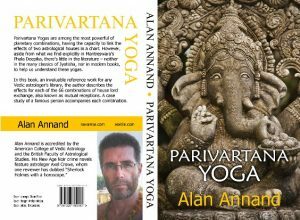 Without jumping through hoops to make sense of this, note that the 8th is the prime trikasthana with its associations of violence and trauma. The 9th is the house of dharma, wherein “crooked” Mars typically violates ethics. And the 7th is the “other” upon whom the violent rage of the murderer is projected. 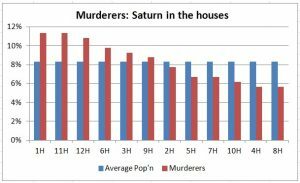 Again, using the 10% frequency cut-off, I found Saturn’s presence higher in houses 1, 11 and 12. To tease out the logic, let’s keep it simple. Saturn in the ascendant suggests a potentially cold personality, a person with scant regard for others. Its position in the 11th echoes that notion of malefics doing well in upachayas, but perhaps more importantly, from the 11th house Saturn also aspects the ascendant. As for the 12th, this trikasthana is associated with the ultimate loss of anything, including life, while Saturn itself is the karaka for death. Imprisonment, which Saturn in the 12th also represents, is frequently the fate of the perpetrator. As is generally well known, the chaya graha have the capacity to act as proxies for any planet with which they have a relationship in the horoscope. The most potent are those with which they associate by sign, and those by which they’re aspected. Next in significance are their dispositors, by sign and nakshatra. In this research, I’ve focused on the nodes’ capacity to act for Mars and Saturn, via association and aspect only. In examining the 195 horoscopes in hand, I discovered that the influence of Mars and/or Saturn on the nodes was largely unremarkable. On average, Mars or Saturn will associate with or aspect one of the nodes in 33% of all charts. On the other hand, if we require both Mars and Saturn to associate with or aspect a node, this will be found in less than 3% of charts. 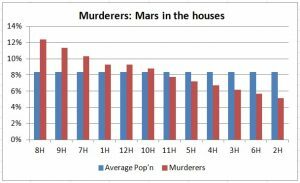 But in both instances, murderers weren’t much different from the average population. The sole exception was when Mars and Saturn simultaneously occupied the same signs as Rahu or Ketu. In other words, Mars and Saturn were both with Rahu or both with Ketu, or Mars with Rahu and Saturn with Ketu, or Mars with Ketu and Saturn with Rahu. 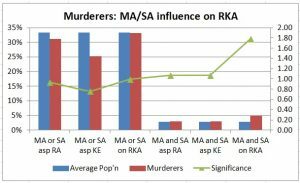 Although the odds of this occurring in the general population are only 2.78%, the frequency with which this pattern occurred in murderers was 4.95%. Admittedly, this is only a couple of percentage points different from what’s expected on average. However, note the right-hand scale on the graph above, where I’ve plotted “Significance” as a ratio of observed occurrence versus expected occurrence, and you’ll see that it’s almost double what’s expected by chance. Again, this is a small study, and my home-made yardstick of “significance” is certainly less robust than the far more rigorous definition used in formal statistical analysis. And yet, it does flag one factor for interpretation. As chaya graha and malefics, Rahu and Ketu have their generic natures, Saturnian and Martian, respectively, so they already represent a tag-team of trouble. But the nodes are also amplifiers of whatever else contacts them. So if Mars and Saturn join in, we get an exponential increase of power on this classic axis of evil. Mars and Saturn are also malefics, but natural enemies as well. When they sit on either or both ends of the nodal axis, they simultaneously influence each other, and both nodes. If we borrow the terminology of an arson investigator, this is like adding an accelerant (eg, gasoline) to an already-combustible material. Thus, Mars, Saturn and the nodes combined will only serve to bring out the worst in each other. Even though they lurk unseen as shadow planets, Rahu and Ketu pull strings to provoke, as Shakespeare put it, murder most foul. Nice study! if you add the signs what comes out ? Now, I’m frightened of what I may become. My Saturn and Mars are 24 degrees apart in the same sign and their midpoint is my MC/North Node. I’m doomed.